Our conservation program for western snowy plovers is focused on adaptive management strategies for successful nesting at Naval Base Coronado and Marine Corps Base Camp Pendleton, both of which have protected areas for snowy plovers. With guidance and support from our partners, our Recovery Ecology field crew conducts systematic searches to locate and mark nests and alert the military of their presence. We record nest success and chick survival, estimate the number of pairs and offspring, and identify predation threats and human disturbances. We are developing a research program to help improve the conservation and management of snowy plovers. To understand the habitat features necessary for nesting, we conducted a three-year study on nest site characteristics at Camp Pendleton. We are currently identifying plover chicks with individually numbered bands. If these individuals are recaptured in subsequent years, we will be able to obtain important information on snowy plover movement patterns over time. What Can Color Bands Tell Us? 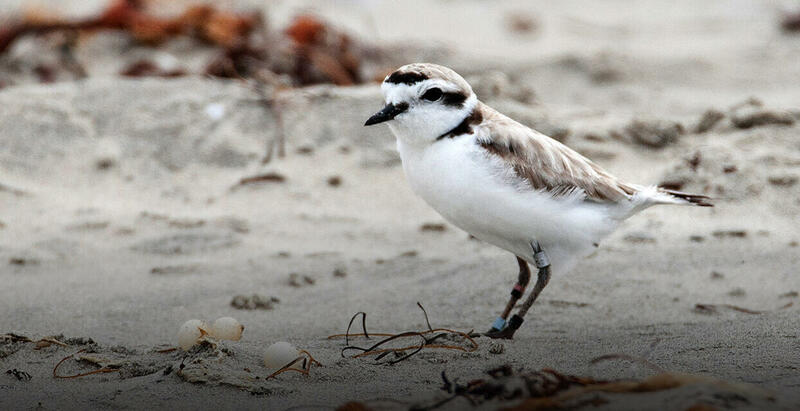 We are working to develop a Southern California-wide color banding program that will include many other individuals and organizations currently working to conserve western snowy plovers. Color-banding has the advantage of making birds individually identifiable without having to recapture them. This would help us answer many important questions: How long do the birds survive on average? Are survival rates different for males and females? How many nests do they have in one season? Do they remain year-round at breeding sites? How many of the breeding birds are from different areas? Do the chicks from our sites migrate to other sites to breed? Ultimately, this information will be incorporated into a meta-population model that will help conserve the species along its entire coastal range. Multiple times every week, biologists from the San Diego Zoo Institute for Conservation Research don yellow vests, affix a blinking light onto their truck, and contact Naval Base Coronado's North Island Tower. They're hoping to get permission to venture out onto an active airfield.